"A great tool for Airmen, Non-commissioned Officers (NCO) and Senior NCOs. 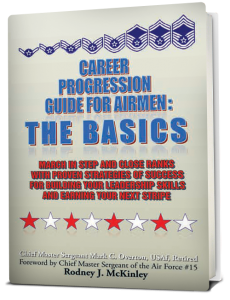 As a retired chief master sergeant, I believe 'Career Progression Guide For Airmen' should be in every NCO and Senior NCO's inventory. It provides many of the tools and insights needed to be an effective leader in today's Air Force enlisted corps. It gives you tested examples and instructions on molding and mentoring your subordinates into Air Force leaders of the future, while supporting your leaders in accomplishing the Air Force's mission. Following the guidance provided will also assist you and your subordinates in getting promoted." You're considering joining or joined the Air Force team. You desire to put your best foot forward at your new job. Maybe you already have your foot in the door and feel job contentment eludes you. "March in step" -- work as a team -- with Chief Master Sergeant Mark Overton's proven strategies of success to "close ranks" --get ahead in leadership and your career. Where other books are theoretical and geared toward soldiers or officers, Career Progression Guide for Airmen extends practical and insightful guidance to develop your knowledge and leadership skills to see, sense, and smell a rewarding career. Overton also supplies you with coaching you must have for growth as a professional Airman. Career Progressiong Guide for Airmen features step-by-step arrangement of the performance report's bullet statements' sequence and six-point chapter key summary to keep your job and career goals in sight. From goal setting, performing to meet expectations and serving to transitioning, Overton covers your career progress and provides you tools to get the job done well and touch and taste building your leadership skills and earning your next promotion!